The Las Vegas mixed use real estate is located at the south “end” of the Las Vegas Strip, near the I 15 exit, Southern Highlands Parkway. At the current construction pace they are expecting a finish in three to four years. Locals will be able to visit department stores and upscale shopping attached to the Las Vegas casino hotel. 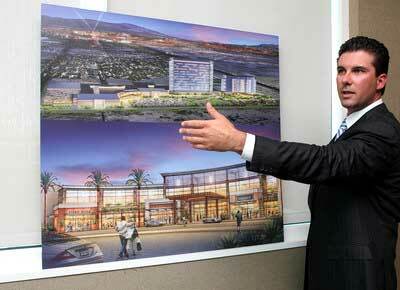 The developer to bring the mall to life is Taubman Centers along with partners MGM Mirage and Anthony Marnell III. Partners Marnell and MGM Mirage would lease the real estate to Taubman to design, build and operate the commercial space. This week during the International Council of Shopping Center convention in Las Vegas, NV. During this show the mall announcement was made along with major department store anchors. Las Vegas real estate is known for its shopping centers. Most recent addition is Turnberry’s Town Square Las Vegas. M Resort would dwarf the size of The Shoppes at Palazzo or the Grand Canal Shoppes in The Venetian. Taubman is familiar with building shopping centers including the Mall at Short Hills in New Jersey, Cherry Creek Shopping Center in Denver and the Beverly Center in Los Angeles, CA, with an average $550 per square foot sales. The mall developer is also providing MGM Mirage Project CityCenter its leasing services several miles north on the Las Vegas Strip. M Resort Las Vegas announced plans for a 1 million square feet mall.